Thanks to DuPont Brass for hanging out with us in the studio this week! DC Music Rocks Festival at 9:30 Club on Aug 18 News: 2 more incredible sponsors! Bias Studios is one of the premier recording facilities in the Washington DC area. Serving the music community for over 40 years. It’s hard to beat our track record: in business since 1973; dozens of Grammy-winning and nominated projects; Gold, Platinum, Multi-Platinum sellers. Our greatest pride is hearing musicians tell us how thrilled they are with their project, having them come back time and again to create with us. Petworth News is a DC blog that shares news and information about Petworth and the surrounding neighborhoods in Washington DC, supporting local music and artists, encouraging pride of place and helping to keep readers informed and engaged. 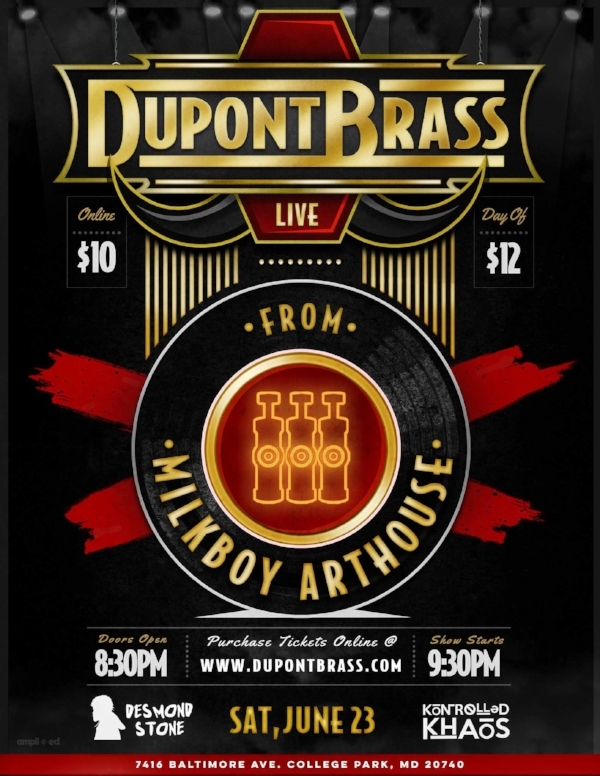 DuPont Brass is a unique, soulful, brass ensemble hailing from the D.C. Metropolitan Area. Originally composed of five music majors from Howard University trying to raise money for tuition during the Christmas season, they have now grown to a 8-piece ensemble consisting of brass, a rhythm section, and vocalists. Gaining popularity from playing at local Metro stations, DuPont Brass started out professionally playing for weddings, banquets, and other private events in the surrounding area. Thanks to the foundation laid in their earlier years, DuPont Brass has had the opportunity to perform in conjunction with the D.C. Jazz Festival and on the prestigious Kennedy Center Millennium Stage. Consistently touching the hearts of the community with their heartwarming testimony, DuPont Brass has been featured on WPFW's “Live at Five” three times and featured in the Washington Post Newspaper five times. Through their training in both classical and contemporary styles, the young group has developed a sound that mixes varied genres of music, including jazz, hip-hop, and R&B. Their latest release entitled Eclectic Soul is a testament to that sound. Overall, the mission of DuPont Brass is to uplift the spirits of people with their music, not just in the DMV area, but across the world. Brian: On DC Music Rocks we're shining a spotlight on the great songs, artists, and incredible people behind the DC regions local music scene. DuPont Brass is a unique soulful brass ensemble hailing from the DC metropolitan area. The group began with five music majors from Howard University trying to raise money for tuition during the Christmas season. Brian: They now have grown to an eight piece ensemble consisting of brass, a rhythm section, and vocalists. They're gaining popularity from playing at local metro stations. DuPont Brass started out professionally playing for weddings, banquets, and other private events in the surrounding area and through their training in both classical and contemporary styles the young group has developed a sound that mixes varied genres of music including jazz, hip hop, and R and B.
Brian: Their latest release entitled Eclectic Soul which you just heard ILM, that's off that, is a testament to that sound and overall the mission of DuPont Brass is to uplift the spirits of people with their music. Not just at the DMV but all over the world. Brian: So I've been a fan of these guys for awhile, I've been following since way before this latest EP came out and I've been such a fan. So for my fanboy moment, it's just, thanks for being here guys, this is really cool. Brent: Thanks for having us. Anthony: Thanks for having us man. Brian: This is awesome. Now, alright, so describe, first and foremost, you got to, since they're listening to you now, introduce yourselves and your role in the band. Brent: Well I'm Brent [Gosset 00:01:33], I'm the tuba player and then the behind the scenes man. So you'll see me playing on stage and then you won't see me again because I'll be running around. Brian: And you'll be the biz guy, I love it. Alright Brent, thanks for being here. Anthony: I like to call Brent Yonce though, because even though he says you won't see him then one minute you won't, people love Brent. People will flock to him. I mean you know for good reason. He's a great tuba player. So yeah. Anthony: My name's Anthony. I'm the music director for the band so I pretty much write all the music, or 90% of it. I choose what we play and like even other peoples songs, I kind of like executive produce it, kind of like tweak it here and there. Brian: Got it, because I was going to say you guys, if they haven't heard you, you play covers and stuff too. Other songs that people know. It's like your own twist on them which is also really cool. Brent: That's the guy with the magic touch. Anthony: Yeah I play trumpet during the show and you know I'm also kind of, field general for us playing and stuff. Brian: Gotcha. A field general and trumpet player and producer and I love it. That's really cool. Now, and the story behind your name? Tell me the story, why is it called DuPont Brass? Anthony: So we were, I mean as most college students are, we were super broke, had no money, you know and we wanted some so. They were playing without me, it was just four of them that were going to Georgetown and playing and weren't making very much money. Anthony: I was in one of my classes, I'll never forget this girl, her name was Jill, she was like hey I always see a lot of brass people playing outside of DuPont circle, maybe you might want to go there. I was like you know maybe. So we arranged some Christmas tunes, Brent bought this Canadian Brass Christmas book and I was just like kind of writing covers of other Christmas songs and I was like hey guys lets just go to DuPont instead. Anthony: So we went to DuPont, set up in between that Krispy Kreme and Panera Bread and just you know took our best shot at it. Brian: That's awesome and that first one went so well that you decided not only is the band going to stick but we're going to call ourselves DuPont Brass? It was that good? Anthony: No. I mean well, we hadn't, we didn't have a name, like one of our, our trombone player was like hey we're the Christmas time band. Anthony: But we just, I remember, one of my friends who was in marching band with us, he was like hey bro are you going out with the DuPont crew today? I was like DuPont crew? That sounds kind of cool. So I was like I know I want DuPont int he name, I was like what about DuPont Brass? I just texted everyone and was like how do you all feel about that? They were like that's cool, and it just kind of just stuck. Brian: Nice. There it is DuPont Brass, came across it, and because you'd been playing at DuPont. That's cool. I like that. The DC region connections, are you guys like actually born and raised here? Or what's the story? Brent: Well I'm actually from Chicago and I came out here to go to Howard University. That's where I met all these guys. Brian: Nice. Alright. What about you Anthony? Anthony: I'm actually from outside of South East DC. So from a place called [inaudible 00:04:47] Maryland. It's closer to National Harbor now if you know about National Harbor. Anthony: Couple other guys, our guitar player's from South East, our main soloist and trumpet player is from [Forestville 00:04:59] area. So we have a lot of people from the area and if you listen to our music we kind of have like a little bit of a like go-go thing. Like bubbling under the surface. Not like an intention of ours but just kind of something that naturally happens. Brian: Sure. Absolutely. If they haven't seen you live then describe, so the pieces to the band, what are they going to see. Like if they come to, you said there's the show on June 23rd, what are they going to see on stage for that? Brent: Well it's going to be two trumpets, two trombones, sousaphone/tuba, for those that don't know what sousaphone is. Then we have drum set, keys, guitar and a vocalist and then one of our trumpet players also doubles as an MC. Brent: So he steps to the mic every once in a while as well. Brian: That's amazing. Talk about you guys on the personal side. So you two outside of DuPont Brass, what do you do outside of DuPont Brass? Anthony: I'm a huge fan of just, like other peoples music. I know that sounds so cliché but I literally just watch YouTube interviews or like of my favorite rappers or I'm always following my favorite rap beat or something like that and then if I'm not watching like hip hop moves then I'm watching basketball. Like I'm a huge basketball fan, I do the same thing with that. I know all the latest stuff that's going on with Lebron James and Kawhi Leonard, Kyrie Irving. So I'm just kind of a basketball and music nerd for real. Brian: Nice and do you play them to or do you just watch them? Like play basketball too? Anthony: Yeah I mean you know I play basketball as well as anybody else in any pick up game but I'm not like you know, guys any good. I would never say that. Brian: Well you know, but I guess I'm wondering, do you actually, do you spend time playing or are you mostly watching? Anthony: Mostly watching, sometimes playing. Brian: Alright, so basketball and music. I love it. Brian: Alright Brent, talk to us man. Brent: So outside of DuPont Brass I also teach part time. I teach part time at [inaudible 00:06:54]School of Arts. Brian: What do you teach? Brent: I teach two [inaudible 00:06:57] and sight singing and ear training. Brent: Then I just started working at the community center last week. Brian: Congratulations man, that's a cool gig. Alright. Especially for somebody who's teaching music and all this stuff. Like boy you get to see it on another level which is awesome. Brent: Being behind the scenes on a macro level is pretty cool. Then outside of that, I love everything tuba. I like listening to a lot of new music. My favorite genres are probably like funk, soul, progressive metal and like, ... big band jazz. So I'm always like searching that circuit for new stuff. Brent: Then video games for real, for real. Brian: Yeah? What are we talking about? What system? What games? Brent: X-box, X-box 1. [crosstalk 00:07:52]. Brent: When I had a lot of time, talking about back in high school days I used to play a lot of X-box but I mean it collects a lot of dust now but I still love to play. Brian: You still love to play. Anthony: Also I will let you guys know that Brent and myself are really good at spades. Brent: Oh yeah. Come see us! Anthony: We beat at least five people at every cook out we go to. Brian: Oh my God and now wait a minute if they don't know what you mean when you say spades, what is that? Brian: Oh we're talking about a straight up card game spades. Nice. Brian: Oh there it is. Brian: I love it, oh man. That's cool. Alright. Check that one out. Now my favorite question to ask, always have to ask, if you could offer one piece of advice, what would it be? This is for both Brent, start with you man. Brent: One piece of advice, what would it be? Brent: So, I pretty much just, what a lot of people don't see about me, I have a lot of successes that people are able to visually see. Or it seems like a lot of successes, but behind that image of a lot of successes is like multiple failures and falls and steps. Brent: So I would just tell most people, excuse me. I would tell people, most people, don't worry about your failures, don't publicize your life so much. Just learn from your mistakes. Gain from your stepping stones that you fall short of, and then turn everything into a positive spin that you can move forward off of. Everything has something to gain from it, whether you like the experience or not. Brian: Everything has something to gain from it, whether you like it or not. I dig that. Thanks Brent. Alright your turn. Anthony: So I mean, I'm going to do a two part thing, super quick though. Number one I just think, you know do the work. Especially while you can. I mean, like when you're young. When you're in college or high school, that's the time you don't have anything else to do but to just work on you. Then number two once you've done that work, just believe that you're worthy. You know what I mean? I mean we deal with that sometimes too, like oh I don't know should we charge these people that much? Do you think we're worth that much? Like you're worth that much, so just believe in yourself and believe in whatever thing you're selling. Believe that you deserve it. Brian: I love that. Yes. Believe you're worth it and you're worth that much, aw so good. I love it and now for those folks who want to find out more about you guys and the cool things happening with DuPont Brass, where do they go? Thanks to Taylor of the pop group, Exnations, for coming by the studio this week! The DC Mayor’s 202Creates September celebration of the creative economy is here. All September, there’s going to be events all over the city! Go attend an event! Events are listed on the website, and if you know of an event that’s not listed, certainly contact them through the website. It sounds exaggerated to say that EXNATIONS’ love of creating music knows no bounds, but that is quite literally case. Sal Mastrocola (vocals/guitar/synth) resides in Brooklyn, just a few state boundaries away from Dan Ciarrocchi (guitar) and Taylor Hughes (drums, synth) in the DMV . Through the miracles of file sharing, home-recording software and caffeine, they present “Never About the Money," their latest single that came to life from multiple East Coast cities. Drummer, Taylor Hughes says, “We were never all in the same room during this process, Sal recorded vocals in his bedroom, Dan recorded guitars with Chris Freeland(Future Islands, Wye Oak) and drums were done with JK Royston out of his studio in Richmond, VA. We’re literally all over the place”. The band plans to release an EP in the coming months in addition to playing shows throughout the East Coast to support its release. Poodell, The Poodle, as discussed at the end of the interview with Taylor! Brian: So much caffeine, they present their latest single that you just heard, Never About the Money. I first stumbled across these guys back, last year, I just, I became an EXNATIONS fan, and I've been following them ever since. And it is such a treat to now have you hear live with me. Taylor, this is awesome, thanks for being here. Taylor: I feel like I've known you forever, but through the internet. Taylor: Internet is a weird place. Brian: It really is, but it's an amazing place, I love it, very cool. Alright so, right off the bat, talk about EXNATIONS. It's a three state deal, like how did EXNATIONS come together? Taylor: Okay, well, I had met Dan, the guitar player, long time ago on the internet of all places. Taylor: We've been Facebook friends for forever, we've been kind of in the same circle. He was in a band called Parks Landing a while back, and I'd always liked the work he'd done. And when I was going through a line up change, Dan was one of the first people that came to mind. So I met up with Dan and we clicked right off the bat. And we're like, "We need to find a singer." And he hit up an old college friend, Sal, to see if he'd be interested, or know anybody who'd be interested in doing this project. And Sal was interested, so the next week probably, I went up to Brooklyn, I met him in a record shop in Brooklyn. Taylor: And about an hour of just chatting and looking at records together, I was like, "I want him in my band. I'm not gonna meet with anybody else while I'm here," because I was supposed to meet up with someone. I went over my time with Sal, and I was like, "This is the man, I want him," so that's kind of how it started. Brian: Wow, very cool. And now, the name EXNATIONS, where does that come from? Brian: So true, you would never win the SEO or the search engine optimization battle on Google to find your band in the keyword, Nations. This is so true. Taylor: Yeah. So we thought the EX was cool we had all come from different bands before, so it was kind of all these ex band members making one new thing, I.e., nation, so it just kind of rolled into the same name, and that's how it was born. Brian: Nice. So the exes were your influence on your name, that's really ... It's sort of, there are so many ways to take that, but I really dig it. That's fun. Alright, and now, you're DC, where are you from? You're local here. Taylor: I am local. I was actually born in Baltimore. I spent the shortest stint of time in Georgetown, I was working at Madewell in Georgetown. But I actually moved back to Baltimore, but I still frequent this area because I love it so much. Brian: And then more about the DC connection then ... Well okay, so a little bit of time in Georgetown, and then here quite often? Taylor: Yeah, and my previous members of EXNATIONS, who I originally met you with, they are actually from DC. So that was kind of like the big DC connection. I was here with them. Brian: Cool, so it's a whole generation of DC going on here, in a way. Brian: Wow. Alright, and now, talk about you on the personal side now, outside of the music thing, what's life like for you outside of that? Taylor: I have a poodle who's named Poodle. Brian: No, no, you have a poodle named Poodle, for real? Taylor: Yes, yes I do. Brian: And that way you can never forget what type of dog he is. Brian: Because if you're wondering, Poodle is a poodle. Oh my god, that's funny. Taylor: In a bow tie. Brian: Oh no, alright, I'm gonna go stalk you on Instagram for that, that's really funny. Alright, and what else, so there's a poodle. Taylor: There is the Poodle. Taylor: I like to skateboard, I like to just generally goof off. I watch a lot of really really bad TV on purpose. Brian: Okay, like what? When you say really bad TV, what does that mean? Taylor: I just finished the new version of 90210 the other day. Taylor: I put myself thought the trauma of terrible TV. One Tree Hill? Been watching it nonstop since 2004. And I love it, it's like something comforting about how horrible it is, I love it. Brian: Oh, man. And to every body out there who loves those shows, we show appreciate you too, but that's really funny. Taylor: We should talk about it, like I do love it. Brian: Reach out and talk to her about 90210 and One Tree Hill for sure. Oh, man, that's funny. Alright, so now back to you as a performer then, talk about the funniest moment that comes to mind when you think about performances and EXNATIONS. Brian: Came out to you meaning, so she's a lesbian? Came out to you. Brian: That's something important that people want to tell you, okay, that's funny. Taylor: Yeah, so she came up to me, and she just came out to me, grabbed my face, and kissed me. Like tried to kiss me, and I backed away, I was like, "Ah!" I backed away really quickly. And when she could tell that I was visibly uncomfortable, she tried to give me $6. That's really weird. Brian: I don't know whether to take that as a complement because she even almost wanted to pay you for the kiss, or whether that's an insult because it's only freaking six bucks, what the heck. Taylor: Well the way that I took it, I was worth more than $5, and worth more than $1, so she combined them and gave me the most ultimate gift that she possibly could put together in her inebriated state. Brian: Oh, alcohol was involved, now I get it. Brian: Okay. Oh man, I love that. Alright, so now, so what's something in your music collection that might surprise us? Brian: Wait a minute, but you are a pop artist? Taylor: But I mean like pop pop, like Taylor Swift, Spice Girls, yes. Taylor: Yes, I love, love, love top 40s pop. And I'm so open about it. I used to have it as like a guilty pleasure kind of thing, but now I'm so open and honest about the pop that I hold dear to my heart. Brian: So favorite Spice Girl's song, it's time to admit it. Taylor: Am I gonna basic if I say, If You Wanna Be My Lover? Brian: You gotta be with my friends. Taylor: Yeah, I had all the Spice Girl Barbie dolls as a child. Still have them, still have them, guys. Brian: Oh, that is excellent, I love it. Alright, so now, go back to the beginning now. When you started performing then, what's your first memory with music? How did music enter your life? Taylor: I was five, and I actually asked for a drum kit. I always knew that I wanted to play drums, and my parents hated that. They're like, "We cannot give this rambunctious five year old a drum kit, like we cannot do it." So they took me to the music store and got me an electric guitar with no amplifier, and closed the door. Brian: And how old were you when this happened? Taylor: So I had this Fender Strat that I would take to elementary school with me, that was pretty much the same size of me, because we had show and tell at school. Taylor: So I would always take my guitar that was bigger than me, and play them, I think Mary Had a Little Lamb was my strong suit at the time. Taylor: Yeah, it was pretty long. Brian: So it started with guitar. And now ... and you know I realized we didn't even mention, so what do you play in the band? And what does everybody else play in the band? Who are the members now? Taylor: I'm the drummer. I also play synth and dabble in bass in the studio, I don't play bass live or anything. Taylor: Dan is the guitarist, and he does vocals. And Sal is the singer, guitarist, and he also does some synth. Brian: Got it. And so it's three pieces going on? Brian: That's it, and you're the drummer, nice. Along with synth and some other things. Well so then your earliest ... I'm gonna switch gears. If you could offer, and this is just my favorite question, and I just want to jump to it because I'm excited about it. If you could offer one piece of advice, what would it be? Brian: Yeah, what's an example? It seems like you have experience with this. What comes to mind? Brian: Tell them you already know. I love it. Alright, all the ladies out there, you heard it, stand your ground in the music store. Brian: I love it. That is really cool. And for those folks who liked the song and want to follow you and the upcoming EP you said that's gonna be released, where do they go to follow EXNATIONS? Taylor: You can find everything at exnations.com. We're on Spotify, Apple Music, super easy to find. Brian: Fantastic. And exnations.com, and then are you social media as well? Taylor: Oh yeah, you can find all of that right on EXNATIONS. And more importantly, for social media, you have to go to instagram.com/poodell. Taylor: It's P-O-O-D-E-L-L, that's my poodle's Instagram. Brian: Oh my god, your poodle has an Instagram. Oh god, I don't know what to say, I don't know whether to be really excited or just laugh hysterically.